NEW: Mayor Michael Bloomberg, who introduced measure, calls vote "right choice"
NEW YORK (CNN) -- The New York City Council on Thursday voted in favor of a bill that would extend term limits, allowing Mayor Michael Bloomberg to run for a third term. New York Mayor Michael Bloomberg wants to seek a third term in office. The vote was 29 in favor and 22 against. 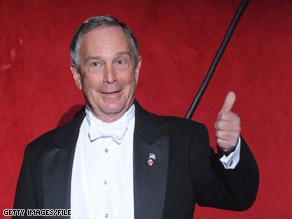 Bloomberg, who introduced the measure, welcomed the council's approval as the "right choice." "Those of us who work on both sides of City Hall must now move forward with the important decisions that face us, particularly finding ways to soften the fallout from the economic downturn and balancing our budget as revenues decline," he said in a statement. "We have a lot of work to do together to get New York through these tough times." The bill allows most elected officials, including the mayor, to serve a third four-year term. Previously, New York mayors had been allowed to serve only two four-year terms, meaning Bloomberg would have been required to leave office at the end of next year. The vote followed two hours of lively debate in a packed room in City Hall, where Public Advocate Betsy Gotbaum frequently admonished council members for going over their allotted time to speak. The chatter in the room prompted her to bang her gavel several times to call for order. The vote also came after the council nixed efforts to put the measure to a public referendum. Earlier, the council voted 22 in favor and 28, with one abstention, against an amendment to the bill that would have called for a voter referendum on the issue of term limits. "New Yorkers went to the polls twice and said, 'We want term limits,' " Tony Avella said, referring to a public vote in 1993 that imposed the two-term limit and another vote in 1996 that maintained it. "For us to overturn that legislatively is a disgrace," he said. "You should be all voted out of office for this." Councilman Charles Barron agreed, reminding his colleagues of a proposal put forth to voters in in 2007 in Venezuela that would have allowed President Hugo Chavez to seek re-election indefinitely. The Venezuelan voters narrowly shot it down. "Mayor Bloomberg, be like Hugo and let the people decide," he said. "If we're talking about direct democracy, where the people rule, and a representative democracy, where those who represent the people come to vote -- if you do this, you're undermining the very people that vote you in to represent them," he said earlier Thursday, arguing in favor of the amendment to put the issue to a public referendum. Council Speaker Christine Quinn noted in her opening remarks that the vote was "a very difficult vote in very difficult times." "Our city, already in recession, is headed for a long and deep downturn," she said. "We will need to do more with less to keep our city moving in the right direction." Earlier in the day, Quinn, an elected official, voiced her support for the bill. "At a time like this, we need consistent leadership," she said. "Voters should have the choice to continue their current leadership. They should have the right to vote for the current mayor or a new one." Bloomberg, who was elected as a Republican months after the September 11 attacks, is credited with helping New York recover economically afterward. He was re-elected in 2005 and became an independent in 2007. The billionaire businessman announced in early October his intention to ask the City Council to amend the term limits so he could run for re-election. "If the City Council should vote to amend term limits, I plan to ask New Yorkers to look at my record of independent leadership and then decide if I've earned another term," Bloomberg said at City Hall. "I care deeply about sustaining the progress we made and finishing the job the voters elected me to do." On Wednesday, council members Bill de Blasio and Letitia James filed suit in a state court seeking to block the council's vote, arguing that it would be a conflict of interest for council members to vote on the bill. The city's Conflict of Interest Board determined last week that the council members' vote would not violate conflict of interest rules. De Blasio and James condemned the board's decision, saying it was "so rushed, so results-oriented, so poorly reasoned and so damaging to the high ethical standards the charter's framers intended." However, Judge Jacqueline Silbermann denied de Blasio and James' petition, and their lawyer, Randy Mastro, has said he will not appeal. According to a Quinnipiac University poll released Tuesday, 89 percent of New York voters said the issue of term limits should be decided by voters in a referendum, not by the City Council. The poll also found that 51 percent of voters opposed extending the term limits so Bloomberg could run again. Forty-five percent of voters were in favor of extending the term limits for their mayor.